Advertisement in the Journal of the Union of Danish Teachers. The text mentions the practical arrangements and advises that members are to contact Rasmus Malling-Hansen in order to sign up for participation in the centenary celebrations and pay the fee for transport and meals. 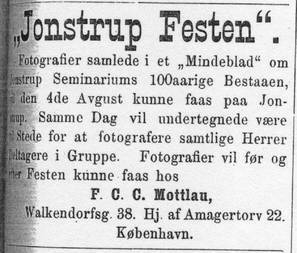 From the other advertisement, also in the Danish Teachers’ Journal, we can draw the conclusion that many photos must have been taken during the Jonstrup celebration. Unfortunately it has not been possible, as yet, to find any of these photos! 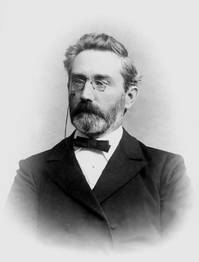 In his biography on Rasmus Malling-Hansen, included in the publication entitled: “Life of the Inventors”, volume 1, 1924, teacher of the deaf-mutes and principal Fritz August Bech writes as follows: “During his entire life-time Malling-Hansen socialised easily with other people, and due to a harmonious balance between humility and self-esteem he had the ability to assert himself and his opinions without any hint of aggressiveness”. And Bech formulated himself with good reason when commenting in this way upon his father-in-law; Malling-Hansen’s generous character of mind and congenial personality made him in many social contexts a “primus inter pares”. Hence, it was quite natural that Malling-Hansen chaired the committee for arrangements of the Jonstrup centenary in 1890. 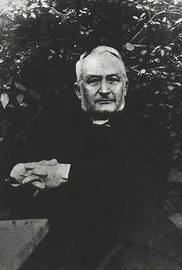 Malling-Hansen suffered from ill health for quite a long period during the first half of 1890, mainly caused by arteriosclerosis and angina pectoris, but apparently he had recovered relatively well in time for the centenary celebrations in the summer of 1890. The official celebration was to be held on the 25th of July, but because this was not very convenient for old Jonstrup alumnae and, in addition, the 6th Nordic school meeting was to be organised in Copenhagen August 8 – 12, Malling-Hansen headed a group of old Jonstrup alumnae and invited to an “informal”, as it were, celebration of Jonstrup in connection with the school meeting on August 4, 1890. Incidentally, this was quite typical for Malling-Hansen – he was a man of the common people, and in spite of socialising naturally and with great ease with royalties as well as highly trained scientists, he never forgot his origin. As chairman of the organizing committee Malling-Hansen played a very central role during the celebrations. The following article is a verbatim quote from Anders Petersen’s book “The Jonstrup College”, published in 1884 and with an addendum from 1891. In order to convey the very special atmosphere apparently generated during the centenary celebration I will quote the report in extenso – not only Malling-Hansen’s input - , and it will become evident that Malling-Hansen very much contributed to influencing the atmosphere of the jubilee with his unique talent to illustrate a solemn and emotional retrospective of the pleasures and duties of their youth, combined with an impassioned vision of the teacher’s role as custodian of society’s responsibility to foster and educate new generations. Anders Petersen, 1827-1914, graduated from Jonstrup in 1855, i.e. one year after Malling-Hansen and became a teacher as well as a writer. Three letters that Malling-Hansen wrote to Petersen in 1883 have been preserved, - see the list of RMH letters. 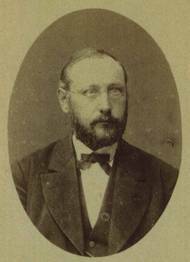 Anders Petersen, 1827-1914, teacher and writer, graduate from Jonstrup in 1855. Photo: The Royal Library. 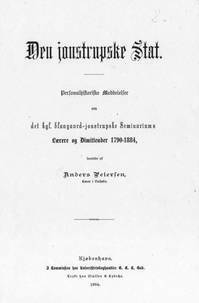 The excerpt included here is quoted in extenso from this publication: “Den Jonstrupske Stat” (The Jonstrup College), edition of 1884, with addenda of 1891. Author: Anders Petersen who was also present at the jubilee. The Celebrations of the Centenary of the College. In spite of the fact that the annual celebrations, as well as the 50 year anniversary, have been held on March 14 in order to commemorate that teaching started on that day at the college, this time however it was decided to organize the official centenary celebration of the establishment of the teacher training college on the very day of the Royal mandate of 25th June, 1790. However, since a majority of the alumnae preferred the celebration to take place simultaneously with the great Nordic school meeting in the beginning of August, and the principal of the college had commented in writing that “since the planned celebrations are mainly of an official character and the expenses will be defrayed by the Ministry, it will not be easy to organise it in such a way that a smaller or larger private group might join in”, this led to a situation whereby 43 alumnae, headed by the principal of the Royal Institute for the Deaf-Mute, reverend Malling-Hansen, invited for a memorial celebration on August 4, 1890. Following articles in the daily newspapers “Dagbladet” and Berlingske Tidende” and in my capacity as participant in both celebrations, I would like to report as follows. (In the original manuscript item “A” is a report from the official celebration on June 25, 1890, but since Malling-Hansen was not present at this commemoration, we shall not include it here on the Malling-Hansen website). 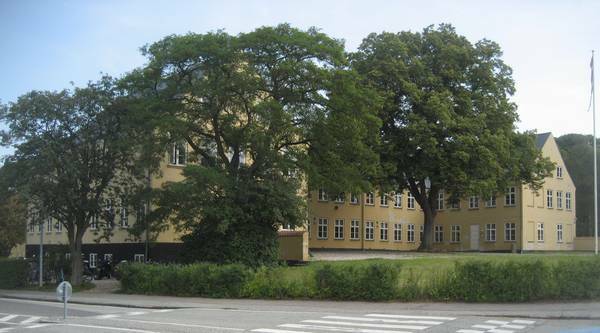 Jonstrup Teacher Training College, seen from the south. “To him had been conferred the honourable task of giving a speech to His Majesty the King, and he had happily accepted this assignment. This was an opportunity to speak exactly the way he was feeling and thinking. The reason for remembering the King at this celebration was that the festive mood lifted us up onto a higher level than the commonplace and mundane. We felt a need to have the King partake in our celebration; we wanted to share our joy with the King, whom we honoured and loved. And it would verily be highly unnatural if the King was not remembered at this celebration, for we were gathered here in order to celebrate a jubilee of teachers, and the teachers had indeed also their duty, following the command of the holy script, to foster the children’s feeling of respect and love for the King. God save and bless the King! We, the Danes, are fortunate to pronounce this wish with all our heart. Our King has always with manly determination asserted his own honour and that of the country. Once when provoked the King had indignantly refuted the mere idea that he could ever break his royal pledge. And if we refer to the King in his capacity as a private citizen, how lovely his family life is being conducted, and in truth it makes us all proud to observe this family home, where at times all Danes may witness the gathering of the mightiest rulers in Europe. May God grant the King a long life. And may the enlightenment spread by the teachers to the people contribute to nurture a spirit of harmony and drive away the seed of discord!” (Loud shouts of applause). JMC: This is only about 15 kms from the center of Copenhagen, at the time a small village. Today it is a location within the municipality of Ballerup, which in its turn is part of Greater Copenhagen. The present spelling is Måløv. JMC: The speaker uses a markedly old-fashioned and solemn style of Danish, quite typical for the national-romantic period in the history of Denmark and for this kind of celebrations, and I have tried to convey this in the translation. 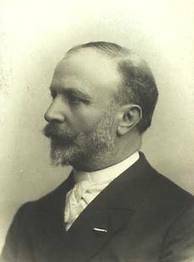 The musicians were led by Jens Ferdinand Vater, 1838-1916, musician, conductor and councillor of war. Photo: The Royal Library. 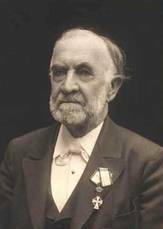 Principal Odin Wolff Tiedemann, 1822-1897, welcomed the parade of Jonstrup alumnae. Photo: The Royal Library. 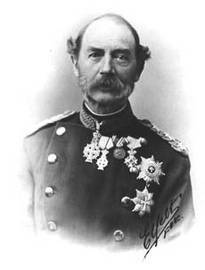 The Danish King, Christian IX, 1818-1906, was highly beloved and respected by teachers of his era. 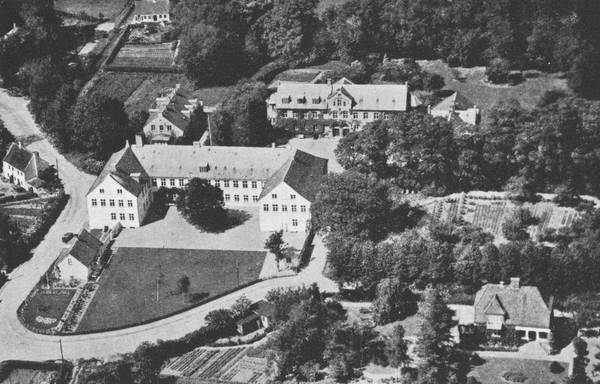 Jonstrup Teacher Training College – aerial view. The old Jonstrup building on a photo from 2013 by Jørgen Malling Christensen. “Old Jonstrup, festival participants and, in particular you, brothers and sons of old Jonstrup!We are all well aware that we have come together to celebrate, for an entire day, the centenary jubilee of the Royal Teacher Training College, its existence and achievements; but on the other hand probably very few of us know how many years of the history of Jonstrup are represented in living memory here today. Representing the history of the teacher training at the college we have Inspector Carl Mortensen honouring the celebration (he enrolled at the college as a student in 1849 and became a lecturer in 1851) by his presence, thus representing almost 40 years or close to half of the hundreds years. Next we have the eldest of the sons of Jonstrup present here today, retired lecturer Hørup, whose part in Jonstrup’s history goes back to 1830, hence 60 years; and above all I must mention our guest of honour, Madam Jensen, widow of Mr Jensen, Councillor of State(Hear! Hear! ), widow of the honourable principal Jensen. Madam Jensen moved into Jonstrup in 1828 and has now for a number of years actively followed the history of the development of Jonstrup, in other words representing a span of 62 years. Thus, only a third of the 100 years is missing, - otherwise we would have witnesses here today of the entire development of Jonstrup. We, the brothers assembled here as celebrators, are about 200; together we form a coherent group from 1830, spanning more than half of the period of the jubilee of now living witnesses to the achievements of the Jonstrup Teacher Training College. Before conveying our thanks and felicitations to the jubilarian, I must bring to your attention that this congratulation is only meant as a point of departure, or a framework, within which many of you, my brothers, may express your congratulations in the course of this festive day. Hence, when in a few minutes I have finished my speech, then far from everything that should and ought to be said in honour of the jubilarian will have been expressed; only late this evening when the celebrations are over, everything that needs to be said in honour of Jonstrup will have been uttered. And when I look back to my stay at Jonstrup - approximately 40 years ago – in order to capture that which we may all agree about in a joint acknowledgement to Jonstrup, then first of all I think about this: We learned hard work, we learned diligence, the importance of a well prepared piece of work, and not to put aside the task, even when it did not please us. The college was characterized by a spirit of diligence and activity, emanating from the principal and prevailing with almost all of the teachers, and it imbued the students in such a way that whoever was an incorrigible lazybones was apt to become the laughing stock of the others. Well, that surely did not prevent us, merry and happy young people, from taking a nap here and there or gallivanting around in the neighbourhood now and then. But there was certainly dedication within the old castle, perseverance was indeed taught, and diligence and assiduousness have the sons of Jonstrup disseminated throughout Denmark at all times. And for this we give thanks, old Jonstrup! The next item around which we can all gratefully agree, is our pedagogical education, something which is presently much too underestimated. Although we did not get much practice in pedagogical work, at least we did acquire a sound and useful foundation of knowledge and ideals, and while it might in general not have sufficed to excel in an academic exam for job applications, it was a sound and solid bedrock on which to continue building in our teaching jobs. The value of such a foundation, and the consequences of not having it -, well, my brothers, I have in my personal life and in our shared experiences frequently encountered people who started their teaching jobs without such a foundation. With such people I have very often noticed so much wavering and insecurity for long periods, resulting in extended periods of hard toil before they could manage their work, and hence I have in the course of my long life as a teacher had ample reasons to be grateful for my pedagogical preparation. And I am certain that we can all agree around this: Thank you, old Jonstrup! Brothers, it was in the bloom of our youth that we were gathered here; in spite of all toil and labour they were still the most joyful and happy years of our life; old Jonstrup was only on the surface a strict mother, she would always turn a blind eye to our youthful pranks and she rejoiced in the many friendships created here, lasting a life-time, firm relationships based on happy memories, even when geography and years have distanced the friends of youth from each other. Therefore: Thank you, old Jonstrup! And looking back through the 100 years, we must thank Jonstrup for playing an important part in promoting the teaching profession, which towards the end of the last century and the beginning of this century was lagging behind, and now for a long time has been ahead and is a spearhead in our time. In the past the teachers were behind; the teaching profession had not established the training college and was not the one to provide rules for school teaching. The teaching profession merely followed along in the old ruts. But now, in the last two decades, the teaching profession has been taking the lead and we have now for many years vigorously and impassionedly argued that the teachers need further education, but also that we need, above all, more teaching time for the rural children, who are certainly not “overburdened”. The teaching profession now realizes and points vigorously to the phenomenon that while the railways and the telegraph have brought all people much closer together and made the world small, at the same time gaining a position in life has become correspondingly more difficult for the individual, the fight for survival and prosperity has become more complicated. Hence, this development has made it essential that the education and the tools that the school provides to the individual – tools of the mind and tools of the heart – become richer and sharper. And yet: the progress of our school education remains much behind the actual challenges which present-day society poses for the individual. Old Jonstrup has contributed to open up the minds of its sons to this fact, and therefore we give our thanks! And looking back once more through the 100 years, far back in time we find a teaching profession given very little respect, but now a profession being appreciated more or less in accordance with what it deserves. Let me put it like this: It would seem reasonable to state as a general rule that we may measure and assess a country in relation to how it appreciates its teaching profession. In this respect much progress has been made throughout the period, and Jonstrup has certainly lent its hand – for that we thank you! JMC: Jens Jensen, 1796-1875, principal of teacher training colleges and school textbook author. Lecturer at Jonstrup from 1826 and stayed here for 42 years, from 1838 until 1868 as principal. Jensen was hard-working, a man of order and the rule of law. He did not understand or condone the new ideas brought forward by Grundvig and Kold regarding the school and the role of education in a changing society. Given the title of Councillor in 1864. Married in 1828 with Francisca Lagerte Lucia Comestabili, adopted name Petersen, born 1809 in Copenhagen, dead 1896 (Source: Dansk Biografisk Leksikon). JMC: RMH uses the occasion to push for what was certainly one of his hobby-horses! His observations and ideas about the role of the teachers in relation to changing needs in a rapidly changing world are lucid, relevant and sharp. There can be no doubt that he was one of the great radical pedagogical reformers of his time, not only within special education but in terms of pedagogical and educational issues in general. And his observations, so eloquently expressed in his speech, remain as relevant in today’s debate about the role of teachers and the school system! School inspector Lauritz Otto Theodor Wiggerts, 1844-1922, was one of the speakers of the morning celebrations. Photo: The Royal Library. Both of the Malling-Hansen brothers were present at the jubilee. 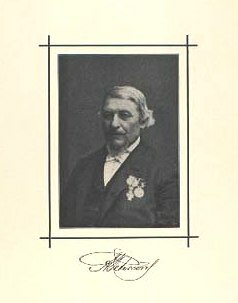 The brother Thomas Jens Jørgen Hansen, 1837-1918, who graduated from Jonstrup in 1856, gave a speech for the minister of education and culture, Scavenius, at the evening arrangements. Photo: Private. The youngest brother, Johan Frederik Oluf Emmanuel Hansen, 1839 – 1919, graduated from Jonstrup in 1859. Photo: Private. The first part of the celebration was thereby concluded. Led by the music corps the participants approached the tables which had been placed along the long, beautiful maple-lined avenue and set with large open sandwiches, beer etc. Lunch was enjoyed here in the most enthusiastic atmosphere, and there has probably never before in the 100 years of its existence been such an animated party in the old castle or in its garden. After lunch reverend Malling-Hansen took to the speakers’ chair and thanked, under much support from the participants, for the very warm and heartfelt words of welcome. Rural dean Tidemand also gave thanks on his own behalf and on behalf of his fellow teachers, highlighting in inspired phrases, that at this college true freedom ruled, and that in the relationship between lecturers and students there was the kind of spirit of love, necessary for the efforts to bear fruit. Once again people gathered around the tables, wine and cake being served, and now various participants took the floor in order to interpret, once again, the sentiments and emotions everyone were feeling in their heart. After having spent the next couple of hours revisiting the old paths and wandering about in the small forest, the gardens and the fields adjacent, finally the hour of farewell struck. The last verse of the last song was intoned; one more “long live old Jonstrup!” was heard, and the very last one “long live the ladies!”- and then the small crowd of old Jonstrup alumnae walked through the village of Maalev back to the railway station and from there returned to Copenhagen. 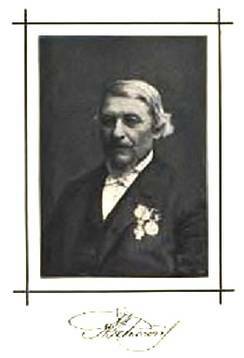 Botanist Hans Mortensen, 1825-1908, for many years a lecturer at Jonstrup. Photo: The Royal Library. 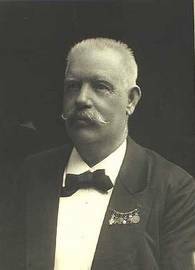 Linnésgade in a photo from 1907. The jubilee dinner took place here in no 25 in the evening of August 4, 1890 in a restaurant owned by Mr Frederik Ferdinand Bock (1849-1919). The five-storey building was erected in 1877 and after recent renovations is still in use. In the evening at 20H00 practically all of the participants of the morning’s celebrations came together for a jubilee dinner at the premises of restaurateur Bock, Linnésgade 25. Previous lecturers of the college were invited as guests of honour. At the jubilee table the chairman of the organizing committee, Malling-Hansen, presided and he led widow after Councillor Jensen, Madam Jensen to the table. The wall opposite Malling-Hansen had been adorned with a large drawing, depicting Jonstrup Teacher Training College and its adjacent environments. The toastmaster opened a long string of speeches, and after having welcomed everyone he spoke in honour of His Majesty the King. By examples taken from the royal visits to the Institute for the Deaf-Mute he showed that His Majesty was “a friend of children to an extraordinary degree”, because he understood how to communicate with them. The speaker proposed three cheers for the King and the participants responded with loud hurrahs and by singing the Royal Hymn (“Kong Christian stod ved højen Mast”). The principal of Ranum Teacher Training College (now vicar of Høje-Taastrup), rural dean Sørensen gave the speech in honour of Jonstrup College. He lingered in beautiful and solemn words on the joint memories “which connected us today”. He described Jonstrup as the abode of youth with all the connotations of that expression. He paid tribute to the memories of the lecturers and in particular to the late Councillor Jensen, remembered by all of his pupils with gratitude and love. Then he spoke about the students, their life and activities at Jonstrup. He finished by expressing his wish that almighty God would in future keep His loving hand over Jonstrup College. School Inspector Th.Hansen from Ringsted spoke in honour of the Minister of Church Affairs and Education, Scavenius, in particular thanking the Minister for his positive attitude and support towards the schools and his energy and efficiency. Accompanied by the wish that the Minister would succeed in his public service for the benefit of the fatherland, he proposed three cheers for the Minister. From former alumnae of students at Tønder Teacher Training College, together at St Thomas, had arrived a congratulatory telegram that was read aloud. A response was sent in which, among other things, was said: Be steadfast in hope and never abandon faith! Teacher Larsen, Brønshøj, spoke in honour of the college lecturers and, in particular, the lecturers present: Carl and Hans Mortensen and Beyerholm. For this toast Inspector Carl Mortensen in his turn gave thanks with a toast for the women. Accompanied by vivid applause Malling-Hansen spoke in honour of the oldest representative of Jonstrup, the widow after Councillor of State Jensen, Madam Jensen, as well as the oldest representative of its past memories, lecturer R. Petersen. After this followed yet many more speeches, and many of the songs written for the occasion were sung. The animated and very successful celebration did not finish until late at night. The report ends with a list of all jubilee partipants, detailing the year in which each one graduated. It is noteworthy that both of Malling-Hansen’s brothers were present – Thomas Jens Jørgen Hansen, graduation in 1856, and Johan Frederik Oluf Emmanuel Hansen, graduation in 1859. It is also mentioned that Malling-Hansen was accompanied by his wife at the jubilee. Anders Petersen also mentions that following Malling-Hansen’s death in 1890, unfortunately there was no complete list of participants from the jubilee celebrations. The list he was using was elaborated by lecturer R.C.Mortensen, A-level school leaver in 1884. That is an interesting piece of information, because in our collection of letters is a letter 1890 from Malling-Hansen to the said Mortensen, in which Malling-Hansen requests his help to complete his information about the participants and asks Mortensen to return the list after having finished the task (see letter of 21 July 1890). JMC: Ranum Teacher Training College, established in northern Jylland in 1848. 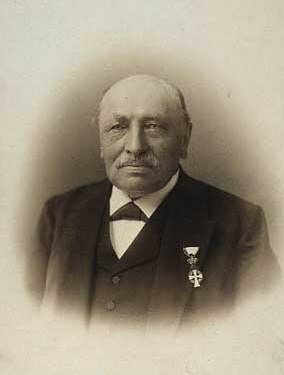 J.C. Sørensen was its principal between 1878 and 1891. JMC: Saint Thomas was the first of Denmark’s three island colonies in the former Danish Westindia (as from 1672), the others being Saint Croix and Saint John. In 1917 these three islands were sold to the USA and are today part of the US Virgin Islands. 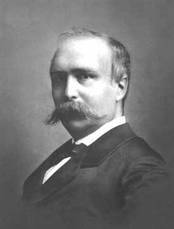 JMC: Carl Mortensen (1832-1893), lecturer in music, writing and drawing 1851-1893. 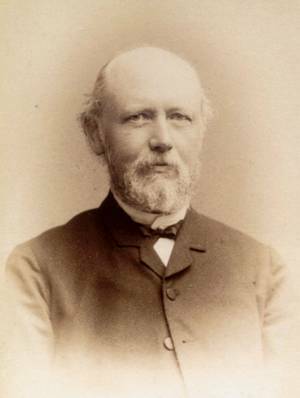 Hans Mortensen (1825-1908), botanist, lecturer 1856-1896. Jørgen Beyerholm, lecturer in drawing and mathematics from 1857. Among the documents left by Malling-Hansen, his wife and daughters, and today kept by family members, is a very beautiful letter, written by Hans Jørgen Jacobsen, for many years editor in chief of the daily newspaper Lolland-Falsters Stiftstidende. The letter came from the town of Nykøbing, Falster, and is dated October 13, 1890. It is addressed to Malling-Hansen’s brother Jørgen, and it reflects the emotions of a solemn editor writing about the very last sign of life he received from Malling-Hansen and about his thoughts, following the Jonstrup jubilee. It is obvious that the jubilee has been a deeply moving and emotional experience for him, and he uses wordings often reserved for the great issues in life, in strongly religious phrases. And his words that Malling-Hansen had now anchored “at a new coast where the work and the development continue under better conditions” must surely have been very comforting to read for his abandoned wife and children. The letter is a transcription, done by Malling-Hansen’s wife Anna, who lived for another 7 years. She died after several years of illness and after having gone through several operations to no avail. Unless I am very much mistaken, the beautiful obituary in “Illustreret Tidende” has been written by C. Bruun, my best friend. He publishes his articles in this journal under the name of “Cab”, and he has had a good many dealings with your brother, in particular owning one of his writing balls. Soon after new year I shall turn 58; old age is approaching; God-willing, however, I can manage to scribble for a couple of years yet; but I leave it all in God’s hands; it is my firm conviction that the voyage through this world does not end with a ship-wreck for the children of God, rather that we shall go to shore at a new coast, where our tasks and the development continue under better conditions. On those shores is now your good brother! JMC: The translation is true to the text; but I don’t understand what he means by this? Why would RMH send a copy of the editor’s own newspaper to the editor himself for safekeeping? It would have been more natural for RMH to keep his copy. Possibly there is a mistake in the transcription? 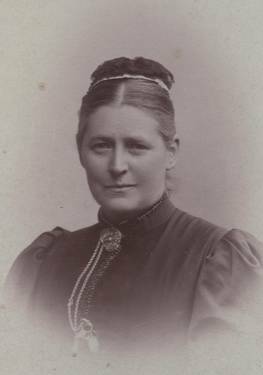 Malling-Hansen’s second wife, Anna, 1842 – 1897, also attended the Jonstrup jubilee. Photo: Private. 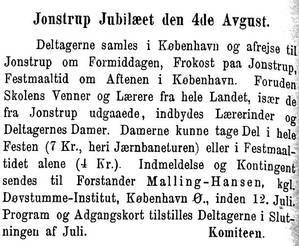 The report from the Jonstrup jubilee was published in “Aarhus Stiftstidende”, August 6, 1890. 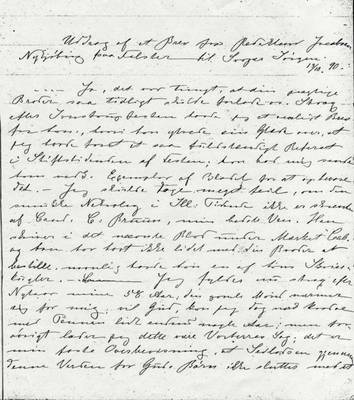 Anna Malling-Hansen’s transcript of the letter to Jørgen Hansen, written by Hans Jørgen Jacobsen, editor in chief of “Lolland-Falsters Stiftstidende”. I denne annonsen fra Danmarks Lærerforenings Medlemsblad går det frem at det ble tatt en mengde fotografier under Jonstrup-jubileet. Dessverre har det ikke hittil vært mulig å oppspore noen av disse bildene! I sin biografi over Rasmus Malling-Hansen, skriver døvstummelærer og forstander Fritz August Bech i Opfindernes liv, Bind 1, 1924: "Malling-Hansen havde hele sit liv let ved at bevæge sig blandt Folk og samtidig at gøre sig selv og sine Meninger gældende uden Spor af Paagaaenhed, i Kraft af en harmonisk Blanding af Beskedenhed og Selvfølelse." Og det var ikke uten grunn at Bech formulerte seg slik når han omtalte sin svigerfar; Malling-Hansens generøse vesen og omgjengelige personlighet gjorde ham, i mange sammenhenger hvor han opptrådte, til "den fremste blant likemenn". 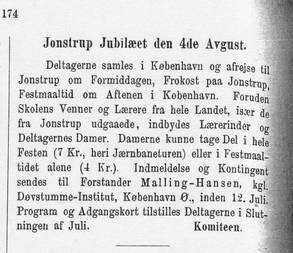 Det var derfor ganske naturlig at Malling-Hansen stilte seg i spissen for arrangementskomiteen, da 100 års jubileet for Jonstrup skulle feires i 1890. Malling-Hansen gikk gjennom en lengre sykdomsperiode i første halvdel av 1890, på grunn av forkalkninger og angina, men var tilsynelatende relativt godt restituert da jubileet skulle finne sted sommeren 1890. Den offisielle feiringen skulle arrangeres den 25. juli, men da denne ikke vær særlig godt tilrettelagt for deltagelse av de gamle Jonstrup-elever, og da dessuten det 6. nordiske skolemøte skulle arrangeres i København 8-12. august, stilte Malling-Hansen seg i spissen for en gruppe gamle Jonstrup-elever og innbød til en alternativ, og vi kan vel si mer "folkelig", Jonstrup-feiring i forbindelse med skolemøtet den 4. august 1890. Ganske typisk Malling-Hansen, forresten - han var en mann av folket, og til tross for at at omgikkes både konger og høyt utdannede vitenskapsmenn med den største selvfølgelighet, glemte han aldri sin opprinnelse. 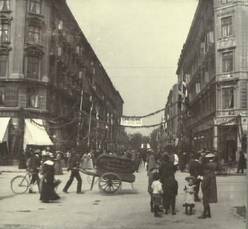 Som formann i festkomiteen spilte Malling-Hansen en meget sentral rolle under selve festlighetene, og artikkelen som følger, er i sin helhet hentet fra Anders Petersens bok, Den Jonstrupske stat, utgitt i 1884, med tillegg fra 1891. For å formidle den spesielle stemningen som tydeligvis oppsto under jubileumsfesten, gjengir jeg hele referatet, og ikke bare Malling-Hansens bidrag, og det vil fremgå med tydelighet at Malling-Hansen i høyeste grad var med på å prege jubileets atmosfære med sin unike evne til å formidle en høytidsstemt tilbakeskuen til ungdommens gleder og plikter, i kombinasjon med en glødende visjon om lærerens rolle som forvalter av samfunnets oppdrager- og opplæringsansvar overfor de kommende generasjoner. Om Anders Petersen, 1827-1914, kan sies, at han var avgangselev fra Jonstrup i 1855, altså et år etter Malling-Hansen, og at han senere livnærte seg som lærer og forfatter. Vi har bevart 3 brev som Malling-Hansen skrev til Petersen i 1883, se brevsamlingen. Skjønt de aarlige Fester, saavelsom 50 Aars Festen vare avholdte 14de Marts til Minde om, at Undervisningen begyndte den Dato ved Seminariet, saa valgte man dog denne Gang at avholde den officielle Fest for Seminariets Opprettelse paa 100 Aars Dagen efter det kgl. Reskript af 25de Juni 1790. Da imidlertid en større Del af forhenværende Elever fandt det heldigere, at Festen blev afholdt samtidig med det store nordiske Skolemøde i Kjøbenhavn i Begyndelsen af August Maaned, og Seminariets Forstander, ved Brevvexling derom, havde yttret at ”da de paatænkte Festligheder væsentligt ere officielle, og Udgifterne hertil bestrides af Staten, vil der ikke let kunne tænkes en Form, under hvilken en større eller mindre privat Kreds kunne slutte sig hertil”, - saa ledte dette til, at 43 tidligere Elever, med Forstander for det kgl. 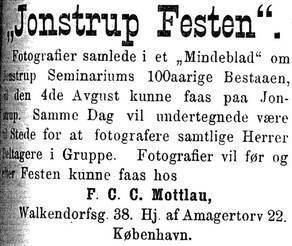 Døvstumme-Institut Pastor Malling-Hansen som Formand, indbøde til en Mindefest den 4de Aug. 1890. Efter Referater i ”Dagbladet” og ”Berlingske Tidende” og som Deltager i Begge Fester meddeles her Følgende om Festlighederne. B. Festen den 4de August 1890. Henved 200 forhenværende jonstrupske Elever afgik Mandag Formiddag Kl. 10 ½ fra Kjøbenhavns Banegaard med Extratog til Maalev Station. Med Hr. Direktør I. F. Vaters Musikkorps i Spidsen og med Dannebrogsflag mellem Rækkerne drog man i udmærket Vejr til Seminariet. Ved Indgangen til den gamle Borg, modtoges Festprocessionen af Forstanderen Provst Tidemand, som i de hjærteligste Ord bød alle Velkommen. Under ”Kanonsalut” og under en Blomsterregn fra Borgens Damer, der havde taget Plads ved de aabne Vinduer, vandrede Processionen derpaa ind paa den imellem Bygningerne liggende store Plads. Her samledes man kort efter om den med Blomster og Flag prydede Talerstol. ”Der var overdraget ham det ærefulde Hverv at tale for Hs. Maj. Kongen, og han havde med Glæde overtaget Hvervet. Han kunde her ret tale, som han følte og som han tænkte. Naar vi ved denne Fest mindedes Kongen, saa var det, fordi Feststemningen løftede os til et højere Stade end det hjemlige, det hverdagsagtige. Vi følte her trang til at lade Kongen deltage i vor Fest; vi ønskede at dele vor Glæde med Kongen, hvem vi ærede og elskede. Og særlig unaturlig vilde det være, om Kongen ikke mindedes ved denne fest. Thi vi vare samlede her for at fejre et Lærerjubilæum, og Lærerne havde jo ogsaa deres Pligt, følgende Skriftens Bud, at oplære Børnene i Ærbødighed og Kjærlighed til Kongen. Gud bevare og velsigne Kongen! Dette ønske havde vi Danske den lykke af fuldt Hjerte at kunne udtale. Med mandig Fasthed havde vor Konge altid hævdet sin egen og Landets Ære. Med Indignation havde Kongen en Gang paa given Foranledning afvist den Tanke, at han nogensinde skulde bryde sin Kongeed. Og saae vi hen til Kongen som Privatmand, hvilket yndig Familieliv førte han da ikke, hvor maatte ikke med Stolthed se hen til dette Familiehjem, hvori stundom under alle Danskes Deltagelse Europas mægtigste Fyrster samledes. Maatte Gud skænke Kongen et langt Liv. Og maatte den Oplysning, Lærerne udspredte i Folket, bidrage til at fremkalde en Samdrægtighedens Aand og til at fordrive Tvedragtens Sæd. Med dette Ønske vilde han udbringe et Leve Kong Christian den Niende!” (Stærke Hurraraab). Den gamle Jonstrup bygningen på et foto fra 2013 av Jørgen Malling Christensen. ”Gamle Jonstrup, samtlige Festdeltagere og i Særdeleshed I, Brødre, Sønner af det gamle Jonstrup! At vi ere komne sammen for den hele Dag igennem at fejre Jonstrup kgl. Skolelærer-Seminariums 100-aarige Bestaaen og Virksomhed, det vide vi alle; men derimod ved vistnok kun faa af os, hvormange Aar af Jonstrups Historie, der her er levende repræsenteret. 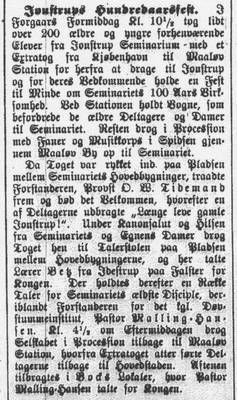 Af selve Lærergerningens Historie her paa Seminariet have vi i Inspektør Carl Mortensen, der hædrer Festen (han kom som Elev til Seminariet 1849 og blev Lærer 1851) ved sin Nærværelse, en Repræsentant for omtrent 40 Aar, eller henimod Halvdelen af de hundrede Aar. Saa er der dernæst den ældste af de her tilstedeværende af Jonstrups Sønner, pensioneret lærer Hørup, hvis part i Jonstrups Historie gaar tilbage til 1830 altsaa 60 Aar, og fremfor alt maa jeg nævne vor Hædersgæst, Etatsraadinde Jensen (Hør! Hør! ), Enke efter Hædersmanden, Seminarieforstander Jensen. Etatsraadinde Jensen flyttede ind paa Jonstrup i 1828 og har i en række af Aar jo indtil nu med Deltagelse fulgt Jonstrups Udviklings Historie, er altsaa en Ræpresentant for 62 Aar. Vi mangle altsaa kun en Trediedel af de 100 Aar for her mellem Jubilantene at have Vidner til den hele Udvikling af Jonstrup. Vi Brødre, vi der særlig i dag ere Gratulanter, møde i et Antal af henved 200; vi danne en omtrent samlet Række fra 1830 gennem over Halvdelen af Jubilæums Tiden indtil nu af levende Vidner om Jonstrups Seminariums Gerning. Forinden jeg nu frembærer vor Tak og Lykønskning til Jubilaren, maa jeg gøre opmærksom paa, at denne Lykønskning kun skal være som et Grundlag, eller som en Ramme, indenfor hvilken mange af Eder, mine Brødre, ville frembære Eders Lykønskninger i Løbet af den hele Festdag. Naar jeg altsaa om faa Minutter har talt til ende, saa er dermed langt fra sagt alt, hva der i dag skal og bør siges til Jubilantens Ære, først i aften sent, naar Festen er sluttet, vil ogsaa alt være sagt, hva der bør siges til Jonstrups Hæder. Og ser jeg tilbage paa min Jonstrup Tid, der ligger omtrent 40 Aar tilbage i Tiden, for at finde det, hvorom vi alle ville kunne samles i fælles Tak til Jonstrup, - saa træffer jeg allerførst paa dette: Vi lærte at arbejde, vi lærte at tage fat, vi lærte Flid, et velordnet Arbejde, og ikke at flyde Arbejdet tilside, selv om det ikke behagede os. Der var en Arbejdsomhedens Aand over Seminariet, den udgik fra Seminariets Forstander, fandtes hos næsten alle Lærerne, og gennemtrængte alle Eleverne saaledes, at den, der var en uhelbredelig Driver, tillige var nær ved at blive til Nar for de andre. Naa, det udelukkede ikke, at vi som glade, ægte Unge, ikke var bange for at tage os en Ræv eller at komme paa Støvlerne en Gang imellem. Men Flid var der indenfor den gamle Borg, og Flid lærtes der, og Flid og Arbejdsomhed have Jonstrups Sønner bragt med du i Danmark gennem alle Tider. Og derfor Tak gamle Jonstrup! Det Næste, hvorom vi alle kunne samles i Tak, det er vor pædagogiske Uddannelse, den der nu kimses for meget af. Fik vi end ikke meget Øvelse i pædagogisk Gerning, saa fik vi et sundt Grundlag af Kundskab og Forbilleder, der vel ikke i Reglen kunde føre til Glimren i en Embedsprøve; men som var et sundt og godt Grundlag til selv at bygge videre paa i Livet i Lærer-Gerningen. Hvad Værd et saadant Grundlag havde, og hvad det vilde sige, at mangle det, ja det har jeg i mit Liv, og i vort ogsaa, mine Brødre, saa ofte erfaret ligeoverfor Folk, der uden dette pædagogiske Grundlag begyndte paa Lærergerningen. Jeg har hos Saadanne saa ofte mærket igennem lange Tider en saadan Famlen og Usikkerhed, saa vældige pædagogiske bommerter, en saa lang Tids Slid, før Arbejdet klarede sig, at jeg mangfoldige Gange i mit lange Lærerliv har havt rig Grund til at takke for min pædagogiske Uddannelse. Og herom kunne vi vist alle samles: Tak gamle Jonstrup! Og saa Brødre, det var i vor fagre Ungdomsvaar, vi vare samlede her; trods Arbeide og Besvær vare de dog de gladeste og lykkeligste Aar i vort Liv; gamle Jonstrup var paa dette Omraade kun i det Ydre en streng Moder, hun saa altid gennem Fingre med mangen herlig Ungdomsstreg og glædede sig til de mange Venskaber, der her bleve sluttede for hele Livet, og ville staa fast til det Sidste i glade Minder, selv om Afstand og Aar have splittet Ungdomsvennerne fra hinanden. Derfor Tak gamle Jonstrup! Og se vi nu gennem de 100 Aar, saa maa vi takke Jonstrup, fordi det i væsentlig Grad har været med til, at Lærerstanden, som i Slutningen af forrige og Begyndelsen af dette Aarhundrede var bagefter sin Tid, nu længe har været forud for sin Tid. Den Gang var den bagud; det var ikke Lærerstanden, der havde skabt Seminariet og anvist og givet Regler for Skoledagen. Lærerstanden fulgte etter i de gamle Spor. Men nu, i de sidste 20 Aar, er det Lærerstanden, der fører an og peger gennem mange Aar med Kraft og Inderlighed hen paa at videre Uddannelse bør vi Lærere have, men fremfor Alt mer Tid, Undervisningstid for Landsbyskolens Børn, der sandelig ikke ere ”overbebyrdede”. Lærerstanden ser nu og peger med Kraft hen paa det Fænomen, at medens Jernbane og Telegraf have bragt alle Mennesker nærmere sammen, klistrer dem op ad hverandre, gjort Jorden lille, har man gjort det at vinde en Position i Livet vanskeligere, Kampen for Tilværelsen vanskeligere, og derved nødvendiggjort, at den Uddannelse, og de Vaaben, Aands- og Hjertes Våben, som Skolen giver for Livet, blive rigere og skarpere – saa er dog Skoleuddannelsens Fremskridt langt tilbage for de Fordringer, som Nutids-Livet stiller til den Enkelte. Gamle Jonstrup har været med til at vække sine Sønners Øie herfor, derfor Tak! Og se vi atter med igennem de 100 Aar, saa finde vi langt tilbage en meget lidet anset Lærerstand, men nu en Lærerstand, som værdsættes omtrent efter Fortjeneste. Lad mig udtale, at at det vistnok som Regel kan siges: Et Land bør værdsættes, efter som det værdsætter sin Lærerstand. I denne Henseende er der sket et værdigt Fremskridt gennem Aarene dertil har gamle Jonstrup ogsaa givet sin Skærv, derfor Tak! En moder bliver ung i sine børn! – Nu er vel saadan, at gamle Jonstrup ikke er gammel, er kraftfuld og ung. Dette er jo, som det bør være. Det enkelte Menneske ældes; men en Institution skal ikke kunne ældes, tværtimod den skal gennem Aarene blive yngre og yngre, det er: kraftigere og kraftigere. Og dette kan vistnok ogsaa siges om Borgen her; men ikke desmindre skønt vilde det være, om her endelig en Gang du fra Børnene kunde gennem Landets Lovgivning gydes ny Kraft ind i Fostermoderen. Det ske! Denne Del af Festen var dermed til Ende. Med Musikk i Spidsen drog man hen til Bordene, der var opstillede i den lange, smukke Ahornallé og dækkede med store Smørrebrød, Øl, m. m. Her indtoges Frokosten under den mest begeistrede Stemning, og der er næppe i de 100 Aar, Seminariet har bestaaet, holdt et saa animeret Gilde paa den gamle Borg eller i Havens Gange. Efter Frokosten talte Pastor Malling-Hansen fra Talerstolen under levende Tilslutning for Seminariets Forstander, med Tak for de særdeles hjærtelige Velkomstord. Provst Tidemand takkede paa egne og Medlæreres Vegne og fremhævede i beaandede Ord, at her ved Seminariet herskede den sande Frihet, og at her raadede den Kærlighedens Aand i Forholdet mellem Lærere og Elever, som var den nødvendige Betingelse for, at Arbejdet kunde bære Frugt. Atter samledes man ved Bordene, hvor der serveredes med Vin og Kage, og nu toge forskellige af Deltagerne Ordet for paany at tolke de Stemninger, som besjælede Alle. Efter at man derpaa havde tilbragt de følgende Timer med dels at bese de gamle bekendte Stier, dels at vandre gennem den lille Skov, Haverne og Markerne nær ved, slog endelig Afskedstimen. Sangens sidste Vers blev sunget; endnu lød et ”gamle Jonstrup leve!” og til allersidst ”Damerne leve!” – saa drog den lille Skare af gamle Jonstrupelever gennem Maalev By tilbage til Jernbanestationen for derfra at retournere til Kjøbenhavn. Kl. 8 Aften samledes saagodtsom alle Formiddagens Festdeltagere til et Festmaaltid i Restaurantør Bocks Lokale, Linnésgade 25. Som Hædersgæster vare indbundne forhenværende Lærere ved Seminariet. Ved Festbordet dirigerede Komiteens Formand, Malling-Hansen, der førte Etatsraadinde Jensen til bords. Paa Væggen ovenover Mall.-Hansen var opslaaet en stor Tegning, forestillende Jonstrup Seminarium med dets nærmeste Omgivelser. Forstanderen ved Ranum Seminarium (nu Sognepræst for Høje-Taastrup) Provst Sørensen holdt Talen for Jonstrup Seminarium. Han dvælede i smukke, alvorlige Ord ved de fælles Minder, ”der forbandt os i dag”. Han skildrede Jonstrup som Ungdomshjemmet med alt, hva deri laa. Han mindedes med hædrende Ord Lærerne derude og i første Række afdøde Etatsraad Jensen, hvem alle hans Elever erindrede med Taknemlighed og Kærlighed. Han dvælede derpaa ved Eleverne og deres Liv og Virken paa Jonstrup. Han sluttede endelig med at udtale Ønsket om, at den almægtige Gud maatte i Fremtiden holde sin kærlige Haand over Jonstrup Seminarium. Leve Jonstrup! Skoleinspektør Th. Hansen fra Ringsted talte for Kultusminister Scavenius, idet han navnlig rettede en Tak til Ministeren for dennes gode Sindelag for Skolen, hans Handlekraft. Med Ønsket om, at Ministeren ret maatte faa Glæde af sin offentlige Virksomhed til Fædrelandets Vel, udbragte han et Leve for Kultusministeren. Fra forhenværende Elever ved Tønder Seminarium, forsamlede paa St. Thomas var indløpet et Hilsningstelegram, som oplæstes. Svar afsendtes, hvori bl. a. udtaltes: Hold fast i Haabet og slip ikke Troen! Lærer Larsen, Brøndshøj, talte for Lærerne ved Seminariet, og da navnlig for nærværende Carl og Hans Mortensen og Beyerholm. For denne Skaal takkede Inspektør Carl Mortensen med en Skaal for Kvinderne. Under levende Tilslutning talte Malling-Hansen for Jonstrups ældste Repræsentant, Etatsraadinde Jensen, og for dets Fortidsminders ældste Repræsentant, Lærer R. Petersen. Derefter fulgte endnu en Række Taler, og mange i Dagens Anledning skrevne Sange blev sungne. Den Animerede, i høj Grad vellykkede, Fest sluttede først sent paa Natten. Til slutt i referatet bringes en liste over alle deltagerne ved Jubileumsfesten, med opplysninger om hvilket år hver enkelt tok sin eksamen. Verdt å merke seg er at begge Malling-Hansens brødre var til stede - Thomas Jens Jørgen Hansen, avgangselev i 1856 og Johan Frederik Oluf Emmanuel Hansen, avgangselev i 1859. Det opplyses også at Malling-Hansen hadde med sin hustru ved Jubileet. Blant de etterlatte papirene etter Malling-Hansen, hans hustru og hans døtre, som befinner seg i familens eie, finnes et meget smukt brev, skrevet av mangearig redaktør av Lolland-Falsters Stiftstidende, Hans Jørgen Jacobsen, Nykøbing på Falster, fra 13/10 1890. Brevet er stilet til Malling-Hansens bror, Jørgen, og det er en høytidsstemt redaktør som skriver om det siste livstegnet han fikk fra Malling-Hansen, og om de tanker han har gjort seg etter Jonstrup-jubileet. Det er tydelig at jubileet har beveget ham på et meget dypt plan, og han formulerer seg slik mennesker ofte gjør når de skal uttale seg om de store ting i livet, i sterkt religiøse vendinger. Og hans ord, om at Malling-Hansen nå har lagt til land, "ved en ny Kyst, hvor arbeidet og Udviklingen fortsetter under bedre Vilkaar", må sikkert ha gitt hans etterlatte hustru og barn meget trøst å lese. Brevet er en avskrift, skrevet af Malling-Hansens hustru, Anna, som overlevde ham med 7 år. Hun døde etter å ha vært syk i flere år, og etter å ha gjennomgått flere operasjoner til ingen nytte. Jeg skulde tage meget feil, om den smukke nekrolog i Ill Tidende ikke er skrevet af Cand. C. Bruun, min bedste ven. Han skriver i det nævnte blad under mærket ”Cab”, og han har haft ikke lidet med din broder at bestille, navnlig havde han en af hans skrivekugler. Jeg fylder nu straks efter Nytaar mine 58 Aar; den gamle mand nærmer sig for mig; vil Gud, kan jeg dog nok kradse med pennen lidt endu nogle Aar; men for øvrigt lader jeg dette være Vorherres Sag; det er min faste Overbevisning, at Seiladsen gjennem denne Verden for Guds Børn ikke slutter med et Skibbrudd, men at vi lægger i Land ved en ny Kyst, hvor Arbeidet og Udviklingen fortsætter under bedre Vilkaar. I hine Egne er nu Din gode Broder! De Baand giælder for Evigheden – derfor var det ogsaa saa velsignet, at vi opnaaede den Dag med din Broder!"